Embark on a 1-hour wildlife safari tour of Everglades National Park. 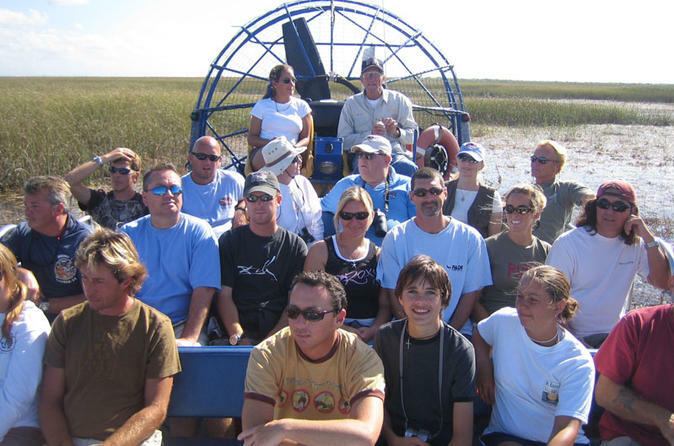 Board an airboat for a ride through this vast and exciting ecosystem, getting a truly up-close view of nature as you go. Learn about the park’s wildlife inhabitants such as alligators, otters even bobcats and bears and discover unique details about southern Florida culture and history. Experience Everglades National Park on a 1-hour, small-group airboat tour of Florida's famous tropical wetlands. Choose one of your boat's comfortable padded seats and settle in to explore this vast ecosystem, which is home to otters, snakes, frogs and alligators as well as lesser-seen bobcats, panthers and bears. Keep an eye out for resident and migrating birds as your boat propels across the water at an average speed of 25 mph. Your expert captain will provide details on Southern Florida's history and culture ― along with information on your natural surrounds ― as you go.